Ostara is a time of awakening. The Goddess begins to stir in February at Imbolc, and by Ostara, the awakening is complete. It is finally spring, and everything awakens from hibernation and experiences a rebirth with the coming of the sun. Even in northern climates, the chill is receding. While it is not possible to go barefoot yet in circle, it is probable that you can leave the Arctic boots at home and perhaps even the winter coat. It is the perfect time to work some sympathetic magick to receive the Goddess’s many blessings. Ostara is celebrated during the Christian Lent, which leads up to Easter. Easter falls on the first Sunday after the first full moon of spring. 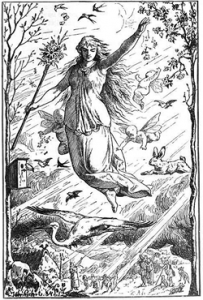 Ostara is celebrated on either March 20, 21, or 22, depending on the position of the sun. On that day, day and night are equal. On the following day, night begins to recede, growing shorter until, at the summer solstice, day reaches its peak. Planting at this time links to the idea of fertility, birth, rebirth, and growth. Ostara, also known as Eostre, is a fertility goddess, and her totem animal is the hare, a symbol of fertility. Ostara and Easter share some common symbols, which originated with the pagan Goddess Ostara. Ostara/Eostre is also associated with eggs, which symbolize birth and life potential. As a moon goddess associated with fertility, Ostara is also connected to reproduction cycles. Sympathetic magick is based on the principle of correspondence, where a sympathetic connection allows one object to stand in for, or represent, another. Reiki healers make use of this principle when doing distance healings using a teddy bear or photograph to represent the client receiving the Reiki energy. During McQueen’s Ostara ritual, eggs are used in sympathetic magick to aid in manifesting what participants would like to reap from the coming season. Each person receives a dyed, hard-boiled egg and a marker with which to draw symbols on the egg. When the ritual is completed, people take home their eggs and either consume them or bury them. Ostara is a beautiful time, full of promise and renewal. As the days pass, they lengthen and become warmer, allowing plants to spring up from the earth and trees to bud. You can take advantage of this time to work some sympathetic magick to boost your abundance, whether that abundance comes in the form of wealth or ideas. The joy and celebration peak at Beltane, the next ritual after Ostara, and one of the two most important Sabbats, Samhain being the other. Imbolc falls prior to Ostara on the pagan Wheel of the Year. It is one of the Greater Sabbats and is celebrated on February 2. The Goddess begins to awaken, even though winter still holds sway in the north. Celebrating Imbolc can help to chase away the chill and it is the precursor to the great awakening that comes at Ostara. Beltane follows Ostara on the Wheel. It is a favourite for many pagans as this is the celebration that has the maypole and is one of the brightest and liveliest celebrations. It also happens at a time of the year when the veil between the worlds is thinnest. Conway, D. J., Wicca: The Complete Craft, Berkeley: The Crossing Press, 2001. Cunningham, Scott, Wicca: A Guide for the Solitary Practitioner, First Edition, revised, Woodbury: Llewellyn Publications, 2006.